Looking a lot like a dwarf rhododendron, until it flowers of course, the Marlborough Rock Daisy - Pachystegia insignis is a rare and unusual sight in the English garden. And why wouldn't it be? After all, its home is found on the far side of the planet! It turns out the the Marlborough rock daisy is a native to the rocky cliff sides of Kaikoura, a town on the east coast of the South Island of New Zealand. 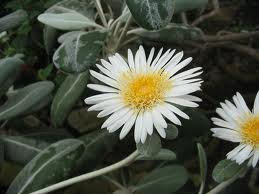 Frost hardy, and evergreen, the Marlborough rock daisy has striking, dark green leaves which, when new, are covered in a heavy felting of silvery, white tomentum. This tomentum is a covering of closely matted, fine hairs which protect the young leaves from drying out in harsh conditions. This naturally sheds as the leaves toughen up with maturity. 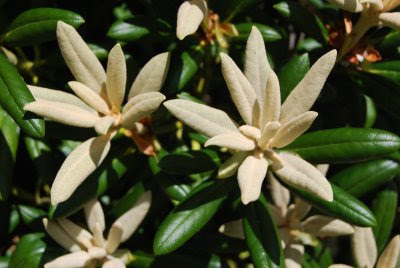 As previously mentioned, Pachystegia insignis naturally occurs on dry, rocky and coastal areas, and this makes it extremely tolerant to both strong winds and salt damage. However, for it to thrive in the garden you need to able to replicate its natural environment, so provide a fertile soil, in a sunny position with excellent drainage at the roots. Get it right and you will find that this jewel of a plant is trouble free and resistant to pests and diseases. Get this wrong and your Marlborough rock daisy is likely to suffer from root damage in the form of fungal rots. Alternatively, plant your Marlborough rock daisy into, preferably, a porous, terracotta pot using a compost mix that has had plenty of horticultural grit or vermiculite added. Sow seed in containers in a cold frame in the autumn using a good quality compost such as John Innes 'Seed and Cutting', but add a few hand full of horticultural grit or vermiculite in order to improve drainage further. Alternatively, semi-ripe cuttings can be taken during the summer.